This Thanksgiving, I’m going to Standing Rock with a delegation of over 50 people from across the US to cook and serve dinner for 500 of the Water Protectors as a small way to give back to Native Americans on our national day of thanks. Looking back on history, Native Americans saved the lives of newly arrived Europeans in what is now Massachusetts by sharing their harvest in the winter of 1620. The Wampanoag, who had lived in the region for some 12,000 years, taught the settlers to grow native crops. The Wampanoag were not the only tribe to be generous. In the earliest days, many tribes throughout the Americas helped new settlers survive. The foods the natives shared with settlers were not just growing wild. They were cultivated over many generations by native people who had a deep connection to the land. Today, many vegetables and fruits in our diet were first cultivated by Native Americans, including foods found on the Thanksgiving table - potatoes, sweet potatoes, beans, corn, tomatoes, squash, pumpkin, and cranberry. The turkey many enjoy on Thanksgiving Day was first domesticated by Native Americans. The idyllic traditional story of the first Thanksgiving in which the settlers shared with the native people in 1621 is largely a myth. Tragically and shamefully, what followed the European arrival was five hundred years of genocide and betrayal of Native Americans. To this day, treaties are being broken for the benefit of white expansionism. In North Dakota, survivors of the genocide are taking a stand against the construction of the $3.7 billion Dakota Access Pipeline, built by Texas-based Energy Transfer Partners, planned to carry highly flammable crude oil under the Missouri River, endangering the drinking water for millions downstream and threatening sacred burial grounds. If successful in eventually reaching refineries on the Gulf and East Coasts, the project will become the source of carbon emissions equivalent to nearly 30 coal plants every year for the next 20-30 years. 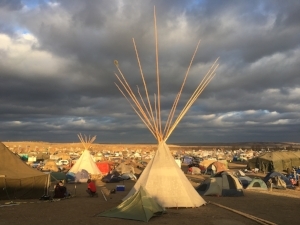 The Standing Rock Sioux, joined by native people belonging to some 300 tribes from across the Americas, are camped along the Missouri river to protect their water, land and way of life. Rather than protestors, the natives call themselves Protectors and are risking their own safety and comfort to non-violently stand up to corporate control and the militarism of armed police in riot gear. The Protectors say they are working for a healthy future for all of our children and grandchildren, including those of the pipeline workers and police officers. Native leader Dallas Goldtooth explains, "The best part of the work we do is that it’s not what we’re fighting against but what we’re fighting for. We advocate for localized, small-scale renewable energy production. The same with food production, localized and sustainable.” I’m going to Standing Rock because I share this vision for our future. A localized economy will not only decrease the power of large corporations and cut down on the carbons of long distance shipping, but will also make our communities more resilience and self-reliant. At the same time, decentralizing our economy spreads business ownership and wealth more broadly and creates meaningful local jobs, building a more just and sustainable economy. I’m going to Standing Rock in hopes that this stand begins a new era in American history when the rights and sovereignty of indigenous people are defended, as well as the rights of nature. As our country reels in the aftermath of a divisive election, now is the time for all people to stand together and become the America that we are meant to be. I’m going to Standing Rock because the native people are spiritually evolved with a deep reverence for nature. In observing their leadership, I recognize the values needed to move our country forward - respect for Mother Earth and all species, cooperation, generosity, non-violence, humility and love. I’m going to Standing Rock to give back to Native Americans for first cultivating many foods that nourish me and for helping the early settlers survive, including my own ancestors who were aided by the Wampanoag in Massachusetts and the Lenape in Pennsylvania. I’m going to Standing Rock because I want to tell the story of the Protectors’ courage and love of the land to inspire other communities to defend our watersheds - to stop fracking, drilling, pipelines, refineries and all fossil fuel infrastructure that is leading toward the end of life on Earth as we know it. Standing Rock is a call to all of us to protect what we love. I’m going to Standing Rock because our civilization, addicted to oil and the wasteful life-style it supports, is racing blindly toward our own extinction by climate chaos and toxicity. Yet again, Native Americans are leading us toward our survival. A Lakota prophecy speaks of a Black Snake crossing the land, bringing with it destruction and devastation. The Black Snake is now inching toward the Missouri River. The Black Snake is a monster driven by greed, destroying all of life in its path and even devouring the children of tomorrow.